Arizona Native Status: Introduced. This naturalized forage plant and honeybee flower is native to Eurasia. 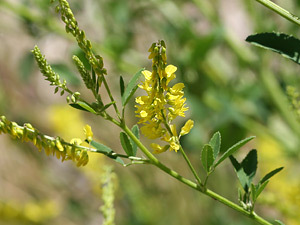 Description: The flowers are in long, narrow racemes. The individual flowers are pea-like and 1/4 inch (7 mm) long. The leaves are green, alternate, and pinnate with 3 elliptic-oblong to egg-shaped, toothed, point-tipped leaflets. The stems are long, slender, and held upright. 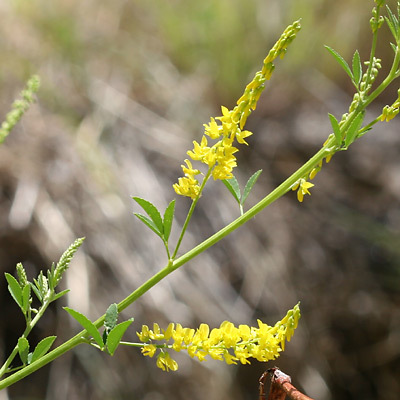 The similar Annual Yellow Sweetclover (Melilotus indicus) has smaller flowers and leaflets with blunt or indented tips. Butterfly Plant – This is a larval food plant for a number of butterfly species. The flowers mainly attract honey bees. Edible – The fresh flowers, roots, seedpods, and fresh, young leaves are edible if consumed in moderation. Old and dried leaves and plants can contain a mold-related toxin and should be avoided. Fragrant – The dried plants have a strong, warm, pleasant fragrance of freshly mown hay due to the presence of coumarin in the plants. Poisonous – This plant contains coumarin that will convert to the powerful anticoagulant toxin dicoumarol if the plants become moldy. 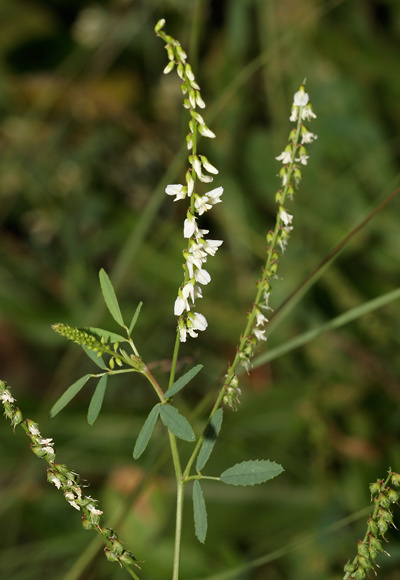 Animals that feed on the moldy, improperly dried plants can suffer from moldy sweet clover toxicosis (a bleeding disorder), which can be fatal.